Jip Jip Rocks Chardonnay 2014 is made from 100 percent unoaked Chardonnay. Light yellow with a pale straw hue. A classic nose of lemon, fresh stonefruit and melon. The palate is clean and fresh with mineral characters underpinning ripe pineapple and lime flavours. This wine will age beautifully over the next 4-5 years. Winemaking report: Gentle pressing and free run juices create the base of this wine. 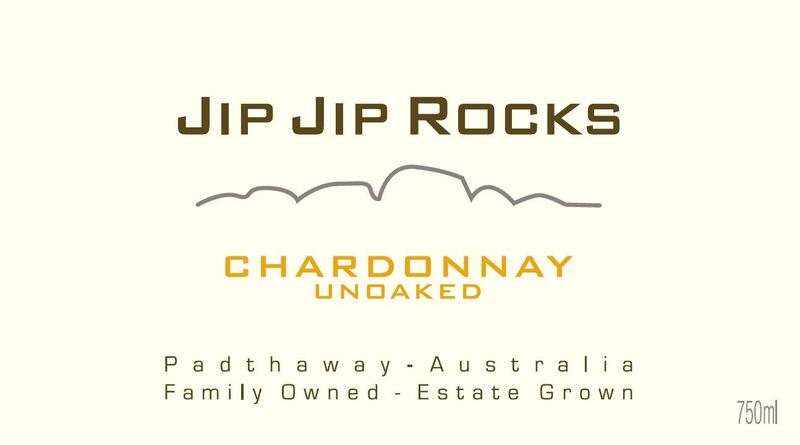 Traditionally Jip Jip Rocks Chardonnay is a 2/3 blend fermented and matured in stainless steel and 1/3 fermented in stainless steel, which receives extended lees contact to add texture and complexity to the palate. The Bryson family has been involved in agriculture for five generations (150 years in South Australia) and has long recognized the potential of the Limestone Coast's maritime climate for producing premium quality grapes. In the early 90's, the family established the Jip Jip Rocks vineyard, in South Australia's Limestone Coast wine region. They have concentrated on growing premium varieties of Shiraz, Cabernet Sauvignon and Chardonnay. The vineyard consistently produces excellent fruit quality from low yielding vines. Only the best parcels of fruit are carefully selected throughout the vineyard and used in the Jip Jip Rocks label. Great attention is given to detail with the integration of fruit flavors and fine oak barrels and helps to produce classic handcrafted wine styles. Their sole objective is to produce the best wines possible from their unique vineyard site. Planted on own rootstock and located in the Padthaway valley which is comprised of rich Terra Rosa soils their estate vineyard benefits from excellent sun exposure producing grapes of optimum flavor, color and tannin development. The warm summer days are moderated each evening by coastal winds that cool the vines and result in a longer ripening period. This extended period allows for the grape tannins and seed to fully ripen prior to being harvested, thus creating wines that are rich and supple on the palate. Their pursuit of great wine can also be seen in the meticulous management of our vineyard. They strive for low crop yields and small grape bunches of intense flavor, and whilst they employ the latest technology in the vineyard to help us achieve vine balance and reduced vigor, they harvest when the fruit reaches full flavor development. Maipe Malbec Rose is 100 Malbec. Intense pink color with violet hints. Fresh red fruit bouquet, strawberry and cherry flavors, balanced acidity, dry and lingering finish. Excellent with tuna or green salad, pasta, spicy Asian dishes.